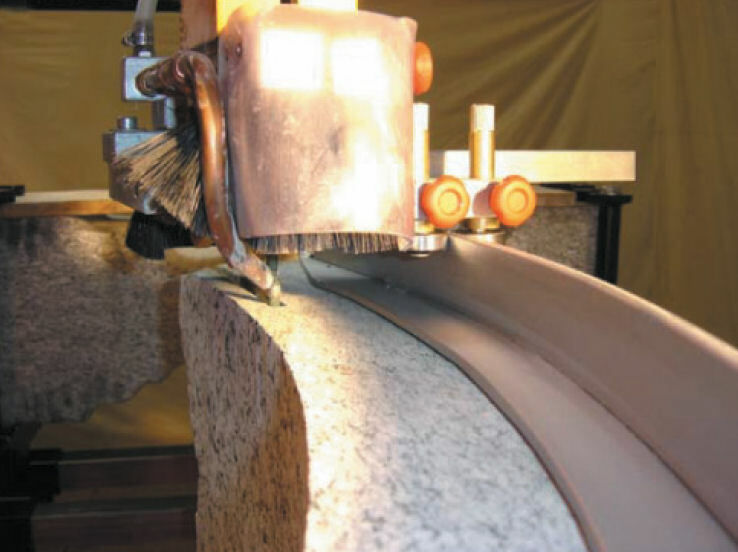 Cut stone arches, columns, balustrades, monuments, and all kinds of cuts in marble, granite or other stone. Special safety features include protective housing for the cutting wire. Available in two sizes: STM 300 and STM 400, with a variety of mounts and accessories for your needs. Operate manually or semi-automatically, using specially-designed support tables and automatic feed devices for cutting in a straight line, or in an arc or in any defined pattern. Top photo: Dario STM 400 Stone Saw for high production, SET 400 configuration with hydraulic motor, articulated arm, column and clamp table to support the material. Right: The smaller Dario STM 300 Stone Saw, with electric motor, sealed against water, for lower production requirements. 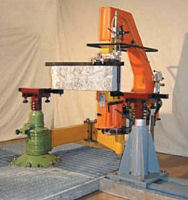 Here it is shown in its SET 400 configuration, with articulated arm, pedestal column and clamp table. 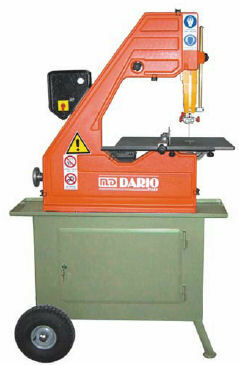 More photos below of devices available with SET 400. 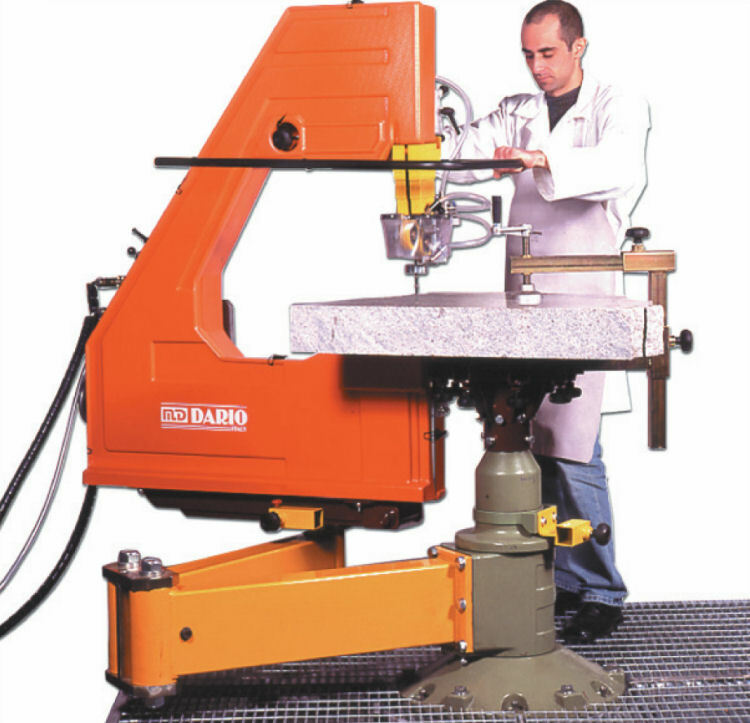 The articulated arm and column allow you to move the saw easily in any direction, rotating 360 degrees around a fixed workpiece. 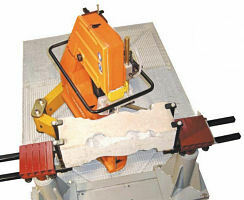 Low voltage, fixed speed electric motor or variable speed hydraulic motor allow both cutting marble and granite. 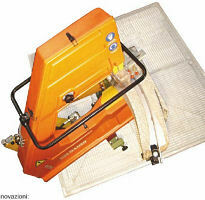 Interchangeable flywheels allow you to use the machine either with the blade or with the diamond wire. 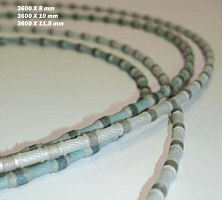 The diamond wire is protected for your safety. 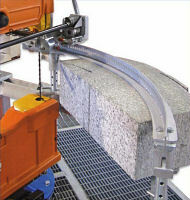 Accessories for specific cuts at fixed radius, pitch and repetition. Anchor the column to the floor or a grill mat. 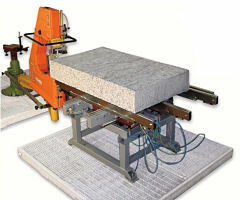 Cuts 100-150 mm (4" - 6") thick. Storage space inside for accessories. Cut stone up to a foot thick (STM 400). Copy shapes and arches at various angles. 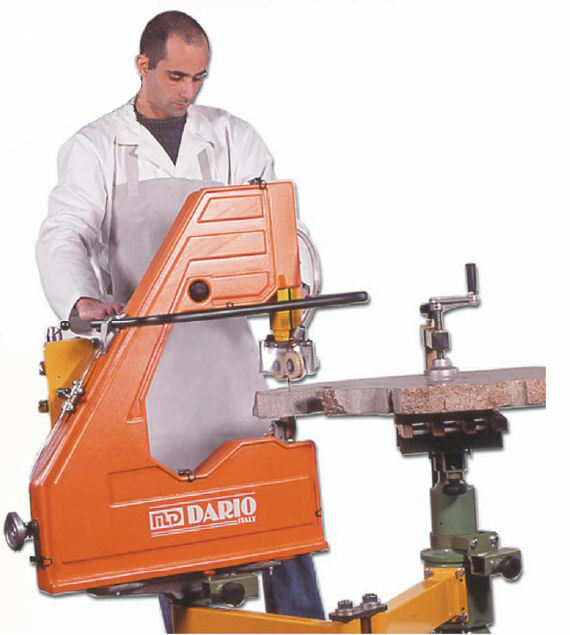 Tilting bar allows you saw at an angle of up to 30 degrees. Above: Stone saw with additional column for cutting arches from both sides and for cutting with a template. Above: This special support has been carefully designed to support large, hard to move, pieces of marble. As the saw advances, two steel bars protrude to support the cut piece and prevent its fall. This support also has a special mechanical device that allows you to advance the piece from time to time, placing it at the exact spot to cut. 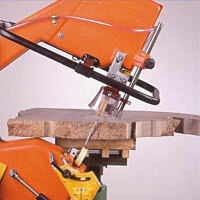 Above: Feed device for automatic cutting of arcs. 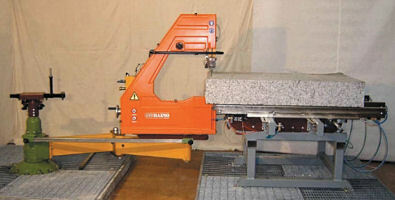 This allow continuous cutting of the material with the use of templates available in various arc angles. 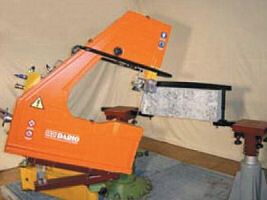 The hydraulic motor will initiate a pinion that engages in a rack placed on a template, allowing the saw to follow the cut automatically without the guidance of the operator. Above: You can add an extra column to the set 400 in order to fix the workpiece. 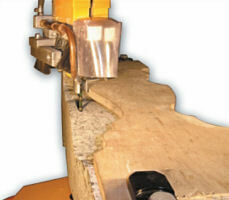 Note that this limits the saw's ability to work from both sides. Above right: Diamond wires, available in 6mm, 8mm and 10mm widths (2400 mm in length) for the STM 300 and 8mm, 10mm and 11.5 mm (3600 mm in length) for the STM 400. 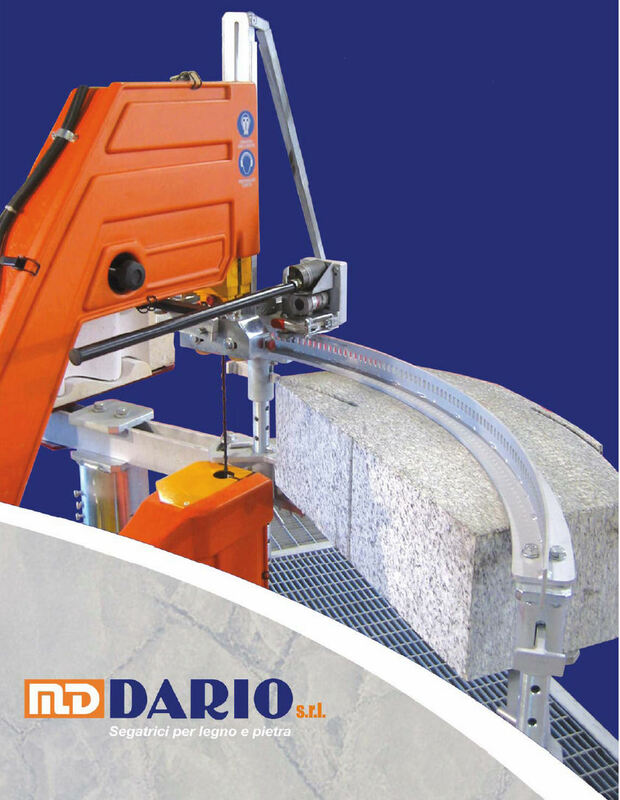 Having developed its innovative bandsaws for cutting wood, Dario of Italy has applied its technology to the cutting of stone, from marble to granite.